book reminded me of my beloved 2001 midnight blue Saab 93; secondly in honour of my youthful past during which time I spent many an hour in a Royal Air Force field at RAF Wildenrath drooling over Phantoms; and last but not least, a few years ago a Dutch publisher brought out an excellent book of a similar concept about the Dutch Air Force. ‘Out of the Blue’ thus displayed all the elements of a jolly good bet, and I just had to buy it. 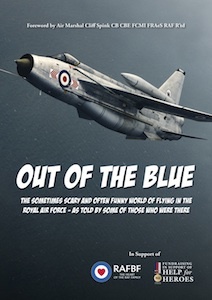 Out of the Blue is compiled by 3 former RAF pilots and comprises more than 80 short stories from the cold war era. These stories have been collected from tens of (former) RAF pilots. Some are humorous, some recount a near-accident incident or a crash. The atmosphere of ‘days gone by’ rises from the page as you read. Despite the fact that I was not able to serve in the air force (a: I did not have to do military service, and b: an F-16 would have been out of my reach) I nevertheless have been passionately interested in aviation since I was knee-high to a grasshopper and have followed it very closely. I used to indulge in endless (English) military plane spotting, and I once even wangled a personal meeting with the squadron commander of the 92nd squadron at RAF Wildenrath. Is it any wonder therefore that I now feel so joined at the hip with the RAF? in England by IFR in a Jet Provost, and when he emerges from his climb through the clouds, comes nose to nose with the Viper Red Jet Provost stunt team on a practice run. Wow! It’s a miracle he and his students survived to tell the tale! And I could go on and on, but I won’t of course, because I don’t want to spoil your reading fun! Is this book all fantastic and wonderful? No. The photos are rubbish. They are black and white and boring and all come from the photo archive of BAE Systems. I had expected them to be more exciting and perhaps even in colour. Apart from this, the book is a wannahave and a page turner. Don’t deprive yourself a moment longer!